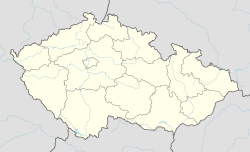 Znětínek is a village and municipality (obec) in Žďár nad Sázavou District in the Vysočina Region of the Czech Republic. The municipality covers an area of 4.30 square kilometres (1.66 sq mi), and has a population of 207. Wikimedia Commons has media related to Znětínek.